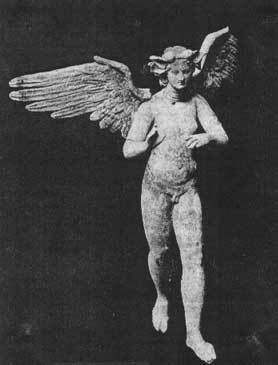 Eros. Greek. Museum of Fine Arts, Boston. Gay is gaiety. We laugh and clown; humor is a subversive tool and a way of walking through the world. Frivolity and lightness is air – joy, our natural element. We are at home in air, as flying spirits, winged beasts and stars. 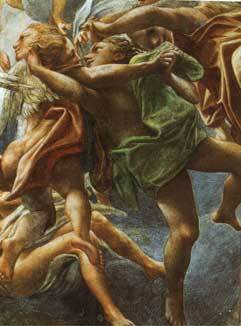 Angels, fairies and witches are all patterns of queer identity, different ways that we have wings. Air is Eros, the winged, androgynous daemon described by Plato as “the craving and pursuit of wholeness.”[i] Through Eros we seek our original form. In ourselves and each other we find our double, our twin, the wholeness described by the archetype of Innocence. Air is without body, weight and gravity. Nevertheless, the atmosphere sustains us. Breath is life. Effeminacy is airy light, and yet it makes us possible. The effeminate soul, transformed in receptivity and sustained in artificiality, is the virgin mother of invention. Air is annunciation, the language that conceives us, the silence through which we disappear. We soar in air, when we use words, laughter, love and community to lend each other wings. [i] Plato, Symposium 189C-191D, trans. Will Roscoe, in Will Roscoe, 1995, (156).